Les Parsons spent years researching the records of Macandrew Bay and this book details the history and the development of early shops, businesses and farming in this part of the Otago Peninsula. Lists of the streets and a record of who lived in each house over the years (up to the 1960s) will be an extremely useful resource to historians and genealogists. 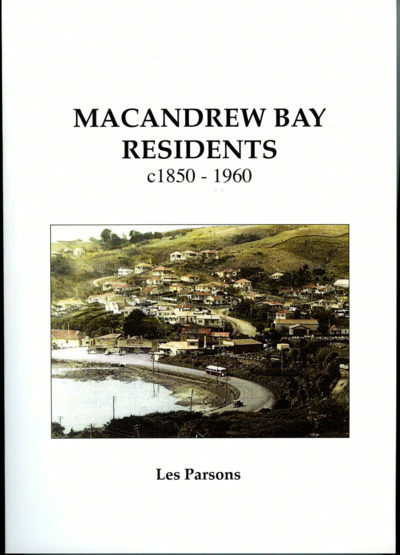 Les Parsons (1937-2103) grew up in Macandrew Bay at a time when everyone knew everyone else in the community. As a youth he spent time walking the streets, delivering milk to each household. 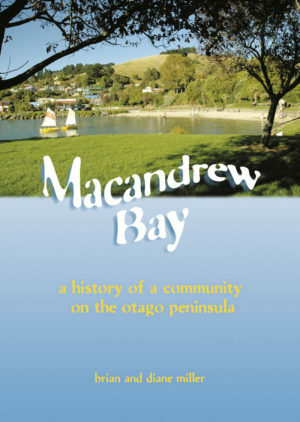 On his retirement in Dunedin, with time to reflect on the early days, he decided to compile a directory of the Macandrew Bay area during the period of the 1850s to the 1960s. He painstakingly worked through electoral rolls and other archival records at the Hocken Library to produce what is now a unique and very useful historical record of “who lived where”. His descriptions of the businesses and residents in the Bay are also timely, as memories of that era are fading and disappearing.